Bennett has just released “Duets II: The Great Performances” on DVD. And what a selection of great performances it is! This is a visual companion to the CD that was released last year, “Duets II”, winning a Grammy and shooting straight to No.1 in the Billboard charts. Featuring collaborations with artists as diverse as Michael Buble (“Don’t Get Around Much Anymore”) and Aretha Franklin (“How Do You Keep The Music Playing”), this shows a singer who is equally at home with fellow legends from an earlier era and modern entertainers. He is also clearly comfortable duetting with singers whose voices are of different styles – how many other artists could sing with Andrea Bocelli (“Stranger in Paradise”), Lady Gaga (“The Lady is a Tramp”) , Mariah Carey (“When Do The Bells Ring for Me”) and John Mayer (“One for the Road”) and still stamp their own personality on each track? That’s testament to Bennett’s immense talent and sixty-plus years of recording – to give you an idea of the span of his career, he has performed for nine U.S. Presidents from Eisenhower to Obama. The release also features a gorgeous “Body and Soul” with the late Amy Winehouse, whose early death (this was her final recording) makes listening to this particularly poignant. Their voices work together so brilliantly, too, and that alone is tear-jerking enough. Particularly beautiful from this collection of tracks is the rendition of “Who Can I Turn To?” which Bennett performs with Queen Latifah. The lush orchestral score and twinkling piano provide a bed as warm and smooth as a velvet hot water bottle for their voices – and a brief, ringing trumpet solo – to soar majestically over. (Incidentally, this is a track that my favourite jazz artist, the great Bill Evans, performed many times throughout his career, and this got me thinking about the excellent collaborations Evans did with Bennett in the mid-to-late 1970s. If you haven’t heard any of the tracks, here is a little taster for you. If you want to see Tony Bennett perform – and, after seeing the tracks from this DVD, I’m sorely tempted myself! – then you’ll get the chance in a few months, because he’s coming to the UK for a tour! He’s playing six dates in England and Scotland in June and July, bringing his unique vocal style to London, Birmingham, Glasgow, Liverpool and Manchester. 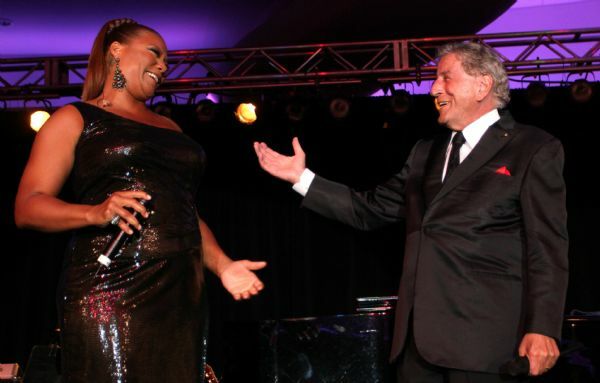 Tony Bennett’s “Duets II: The Great Performances” is available now. Writer. Jazz obsessive. Avid reader. Keen runner.